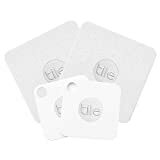 Tile’s various Bluetooth finder tags are obviously the most popular tags in the category, and rightfully so. They’re very reliable and easy to use, and the Tile smartphone app is great. Of course, they’re also pretty pricey which is why it’s so important to take advantage of sales whenever possible. Well guess what: now is the time to pull the trigger. Amazon is running a sale on the Tile Mate and Slim Combo Pack, which includes two Tile Mate tags and two Tile Slim tags for an all-time low of just $39. That’s just $9.75 per tag, which is a price that can’t be beat.